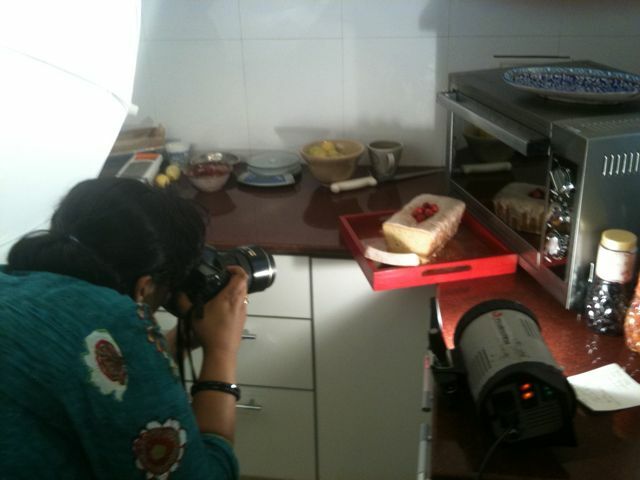 Here’s today’s ‘Piece of Cake’ column in Mint Lounge newspaper – it features a family recipe for yogurt cake and this is what my kitchen looked like when photographer Priyanka was trying to get a shot of it…. I recently read about a woman who’d vowed to take her much-loved masala recipe to the grave, unmoved by pleas of family and friends to share. My heart breaks for her daughters: Despite having a cookbook collection which could fill a medium-sized library, the only one I’d brave a burning building for is my mum’s old handwritten recipe journal. It contains the story of my childhood and the food that made me the eater, cook, person I am. A good cook is made not born, her best recipes have been handed down, tweaked, transformed and adjusted; they have a personal history, a lineage, a soul. I don’t cook everything the same way my mother did—margarine has certainly been banished—but I always feel her at my shoulder in the kitchen, her mother and grandmother not far behind. And that’s an immensely comforting and inspiring kitchen to work in. Today’s yogurt cake comes from another relative and began its passage to India on one of Scotland’s far-flung islands back in 1975, when my aunt and uncle found themselves posted to Skye. While all their belongings, including kitchen scales and measuring cups, were still in storage, auntyji (as we refer to her after a recent visit to India) had been unable to do any baking. So she was delighted to tune into the Jimmy Young Programme, a popular radio show at the time, one morning and hear a recipe for yogurt cake requiring no special equipment, everything being measured out in the yogurt pot. Auntyji’s cake is a moist, no-frills, never-let-you-down, little black dress of a cake; you can take it anywhere, dress it up, dress it down, reduce the sugar, omit eggs, and it will still be eager to please. In its unadorned 1970s form, it’s a soothing bite to accompany a cup of tea; with fruit and icing it becomes a gooey pudding. It’s had to adapt to life in India—the yogurt pots are a different size here—but has also already started winning friends. I took a mulberry-laced version to a dinner party the other night. We ate half of it immediately, then the host devoured what was left of it during a midnight raid on the fridge. The next morning, she was on the phone for the recipe. Here, I’ve made it into something quite decadent, with the addition of raspberries to the sponge and a tangy lemon glaze. And in the universal spirit of recipe-sharing, here it is. Preheat the oven to 160 degrees Celsius, then line a loaf tin with baking parchment paper (it’s worth investing in real baking parchment instead of butter paper as it’s completely non-stick). I use a rectangular tin that measures 10×5 inches (26x13cm). In a bowl, sift together the flour, baking powder, bicarbonate of soda and salt. In another large bowl, mix the yogurt, sugar, eggs, oil, vanilla essence, lemon zest and lemon juice. Beat the mixture well until smooth. Carefully fold the dry ingredients into the wet until everything is well incorporated. The mixture will be more like a thick batter than a traditional cake mixture. Pour half the mixture into the tin, sprinkle half the raspberries, then cover with the remaining mixture. Add the remaining raspberries, then put the tin immediately into the hot oven. Make the glaze by sifting the icing sugar into a bowl and mixing with the juice of about two lemons. When done, the cake should be firm on top and lightly brown and a skewer inserted into the centre of the cake should come out clean. If not, put it back for 10 minutes. Yum!!!!!!!!!!!!! Seems very interesting. Must try it. the kids would love it. as always wonderful post,,,my sis sent me the link of the mint,,,just like me .even she is big fan of ur blog,..:-) goona try the cake soon,,,once the kitchen is restored,.. I loved this piece of cake thanks to your auntyji….. I like all kinds of lemon cakes n with yoghurt it must be soft n moist . Hey, yummm. Just baked one last week minus the yogurt and with an extra egg. Know what, its a good idea to add a pinch of vanilla in the icing and lemon extract glaze. sometimes the icing sugar smell is very obvious inspite of the lemon juice. Hi Sangeeta – Auntiji will be so pleased her cake has travelled so well! hey- looks delicious. question though, where do you find raspberries? i live in bombay (but moved here from new york) and miss them like crazy. i didn’t know they were available in india! oh okay, i saw you answered above. i’m not in Delhi anyway, so no chance of obtaining any there. Been following your blog for quite some time now, iG8 work . its an amazing journey to cover through your posts. Makes me so nostalgic , i have grown very close to those stret shops serving amazing food in chandni chowk and chawri bazar and never would have thought these hidden pieces of gems and their tales would float around the world like this. Though been away from Delhi for almost 18 years now, whenever i am back, always try to put away at least one day for these goodies. Truely an awesome cake ! just by reading through it , it felt so doable and no complicated stuff one associtates with baking . I baked it yesterday ( minus the rasperries) with my 6 year old son, though i do bit of cooking off and on , its a first time i tied cake and result just swept everybody off its feet ( My wife’s tip helped us through in the absence of butter paper or parchment paper) .My son has taken it to his school to share with all his freinds and teacher – A cake he based with his Dad ! Thanks for making us all have just great time !! Approximately how long do you cook the cake? 60min? I stumbled across your blog few days back and its just amazing. I am totally hooked to it. Yesterday I tried the yogurt cake for my wife’s b’day and needless to say I got a lot of brownie points. How do I make this cake without egg? What is s the substitute? Anuj – that’s a toughie for this cake – the eggs have a lot of work to do here because there’s no flour. I’m really not sure, maybe yogurt and some bicarbonate of soda – does anyone else know? writing right after wolfing down your lemon & mulberry cake. After a few glitches ( on my part) the cake turned out to be amazing. Thanks so much for sharing this recipe. Do you think it would work with strawberries- just ask because they are much more easily available here in Bombay. Saumya – thanks for your message – I think this cake can work pretty much any which way! I saw my aunt last night and told her about all the different ways readers had been making the cake. She said she even made it in a microwave once! So definitely worth a go with the strawberries. Wow! This looks brilliant ! I am trying this soon…It looks beautiful and the drizzle on the top looks totally amazing!